INDIANAPOLIS (November 5, 2013) — Klipsch, a leading global speaker and headphone manufacturer, announces today the launch of GiG, the brand’s smallest Bluetooth® wireless speaker and latest addition to the Klipsch Music Center Series. Small enough to fit in a briefcase, backpack or the palm of your hand, the ultra-portable system packs in more than 67 years of premium audio engineering know how. The Klipsch Music Center product line commemorates the brand’s partnership with Live Nation Entertainment and its sponsorship of the Klipsch Music Center amphitheater—one of the five most ticketed live music venues in the world—in its global headquarter city of Indianapolis. Designed to take the concert anywhere, the series of wireless music speakers connect listeners with their favorite artists. Upon the touch of a button, GiG provides instant wireless streaming at the highest sound quality on AptX®-enabled devices. Additionally, listeners can wave a NFC-equipped music source over GiG for instant device pairing. With a high-quality microphone, GiG also presents speakerphone capabilities during which users can transfer, terminate, ignore and even voice dial. International power adapters are included for AC operation anywhere, and a rechargeable lithium-ion battery provides an industry-best 12 hours play time. Producing the Klipsch sound signature are dual 1-inch full range drivers complimented with balanced dual 2-inch passive radiators for rich, musical bass. Advanced DSP equalization provides lifelike, dynamic sound at any volume level. 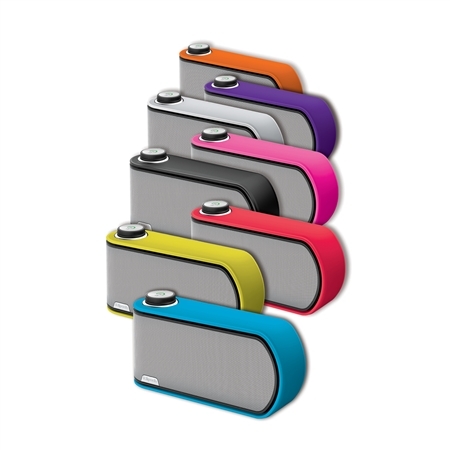 Adding a level of customization and style, the included removable wrap-around band can be switched with any of the vibrant color options (blue, yellow, red, purple, orange, pink and purple) available for purchase on Klipsch.com for $24.99. Available in a black and white finish, with colored bands sold separately, the Klipsch GiG retails for $199.99 (U.S. MSRP) and is now available at authorized retailers. For more information on the Klipsch brand and its product offering, visit Klipsch.com. For over 65 years, Klipsch has designed premium speakers for those who are passionate about great sound. Company founder Paul W. Klipsch started this legacy in 1946, and it continues today with sheer commitment to innovation and delivering the world’s most powerful, detailed and emotional sound reproduction. Today, the brand’s diverse product portfolio encompasses home theater, professional cinema, installed whole-house contracting, commercial, computer speakers, Bluetooth® wireless speakers and headphones. As one of the first U.S. loudspeaker companies, Klipsch continues to be the high-performance brand of choice for audiophiles and home theater aficionados around the world. Klipsch Group, Inc. is also a wholly-owned subsidiary of VOXX International Corporation (NASDAQ: VOXX). For more information, visit http://www.klipsch.com.